From a food perspective, autumn is the most important time of the year in Tuscany. Many of the most highly prized ingredients of the Tuscan diet – truffles, porcini mushrooms, chestnuts, game (wild boar, duck, rabbit and hare) – are in season and are savoured as often as possible. In Tuscany food festivals (known as sagre or feste) are held all year, but in autumn they increase multifold. Most importantly, autumn is when the two pillars of Tuscan agriculture, l’uva e le olive (grapes and olives), are harvested, and the precious new wine and olive oils produced. Grape vines and olive trees have similar soil requirements, are both adapted to growing on rough terrain, and enjoy similar climates (though olive trees are more sensitive to frost than vines). For these reasons they are often grown in tandem; in Tuscany, they have been cultivated together since Etruscan times. After the fall of the Roman Empire, cultivation of these crops decreased dramatically in the region, and by the Middle Ages it was mainly restricted to monasteries.That these two crops today occupy vast swathes of the Tuscan landscape is largely thanks to the influence of the Medici family in the 14th century. The Medici recognised the terrain’s particular suitability for olive trees and vines, and encouraged their cultivation by designating woodland for this purpose, compelling towns and councils to rent the land cheaply to local peasants. 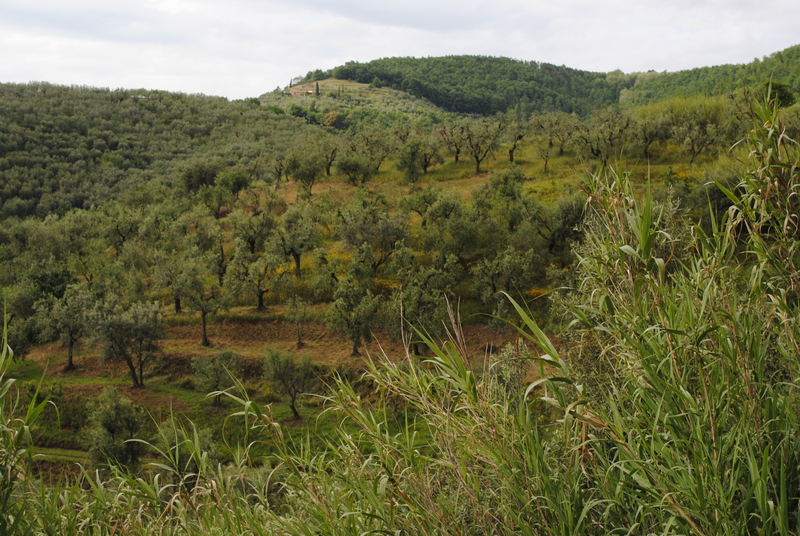 Gradually, widespread planting of olive groves and vineyards spread beyond Medici-governed areas (situated mainly around Florence) to other areas of what we now call Tuscany, such as Siena and Lucca. The Montalbano hills (where our olive grove is located) are also known as the hills of Leonardo, and in this respect these rural landscapes really have changed little since the Renascimento. In the past, our olive grove contained a small vineyard, but sadly the vines were removed and sold off long ago. For me, one of the highlights of the autumn food calandar is a product of both these crops: schiacciata con l’uva (grape focaccia, literally ‘squashed with grapes’), a glorious combination of sweet, juicy grapes and layers of springy olive oil-bread. Schiacciata con l’uva also dates back to Etruscan times – apparently it even features in frescos inside Etruscan tombs. Typical of Florence and Prato, it’s found (with minor variations, such as the addition of rosemary or fennel seeds) all over Tuscany, and is usually made and consumed during the September vendemmia (grape harvest). 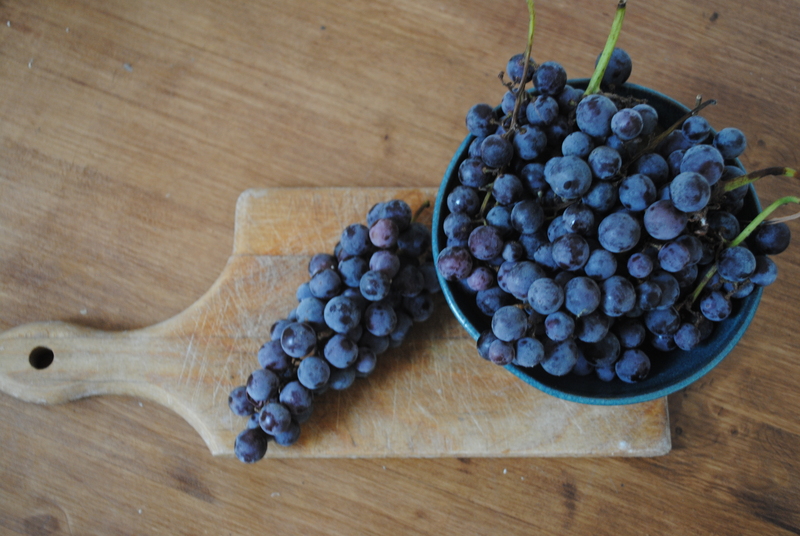 Traditionally it should be made with Canaiolo grapes (used for making Chianti), but it can also be made with uva fragola (strawberry or Concord grapes). Although the grape harvest is long since finished, having received a late batch of the latter we decided to break with tradition and make a late batch of schiacciata con l’uva: the high calorie content makes it ideal for snacking on when we’re hard at work in the olive grove. Dissolve the yeast in the water. 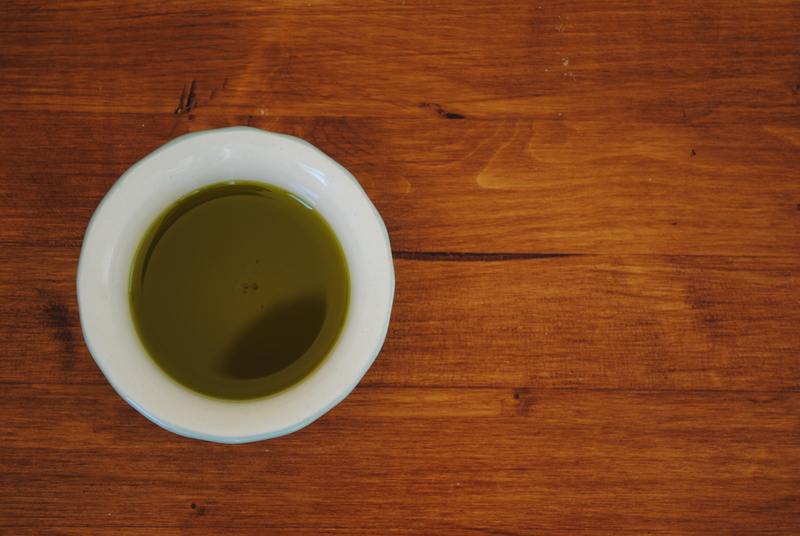 Add a pinch of salt to the flour and gradually stir in the liquid until it has all been absorbed by the flour, then add a tablespoon of olive oil. Knead for 5-10 minutes until the dough is smooth and springy. Place the dough in an oiled bowl, cover with clingfilm or a damp cloth and leave to rise for a couple of hours or until it has doubled in size. Wash and dry the grapes. Punch down the risen dough, and gradually knead in 50g of sugar. Divide the dough in two. Roll out half the dough into a large rectangle approximately 1 cm thick. Place on an oiled baking tray. Sprinkle with half the grapes and 2 tablespoons of sugar, then drizzle with olive oil. Roll out the remaining dough, and place over the first layer like a blanket. 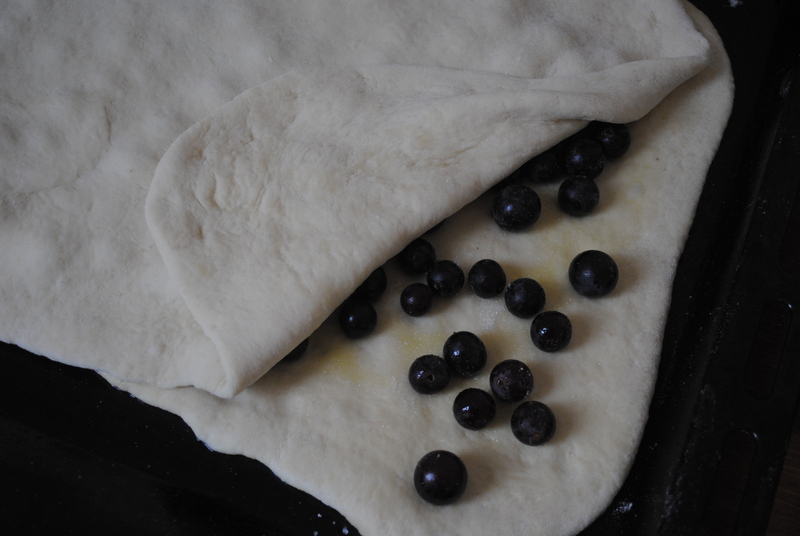 Seal the layers together by turning up the edges of the bottom layer of dough. Using your fingers, make dimples in the top layer of dough and cover with the remaining grapes, another two tablespoons of sugar and some more olive oil. At this stage you can leave the dough to rise again for another 15 minutes. Bake in a preheated oven for 30 minutes at 180 degrees celsius / gas mark 4. If you have a particularly sweet tooth, dust with icing sugar before serving. This recipe looks delicious. I will make it with Niagara concord grapes (and imported olive oil). Also, enjoyed the history of agriculture in your area. Thank you. Let me know how you get on with the focaccia! It’s yummy. Too bad my grapes are now jam…will try and find some and try this. Excellent! Thanks! I really recommend it, although grape jam is also delicious. I’ve never been to Cortona but I’d like to, it’s supposed to be very beautiful. I love tomatoes here in summer, it tastes like you’re eating sunshine. Let me know how the Schiacciata turns out for you… If you can’t find nice sweet grapes then you could maybe add a little extra sugar. A lovely post and an equally lovely recipe! Yes, autumn is great (if you discount the rain). Let me know how you get on if you try the recipe! I make Schiacciata all the time now (blueberries, blackberries, figs, cherries: same principle), but with grapes is still my favourite. I love schiacciata as well, I’m a huge fan! I bake it almost every week. I’m not a huge fan of cooked raisins though. I prefer the simple a sugary version of your delicious recipe: no raisins, just some aniseed and some sugar sparkled on top of the schiacciata for it to get candied….mmmmh! And the “cherry on the top” 😉 would be baking it in a wood oven…. Ah, I would kill for a wood oven. Have you tried it with other fruits (blackberries, blueberries, figs etc)? All delicious alternative to grapes, although plain is yummy too. Yum – this looks amazing! That looks delicious! I’ve never heard of it but we’ll have to give it a go. Maybe we can introduce it to Piemonte! A good idea! I’m constantly surprised at how culturally different Italian regions (and even different parts of the same region) are, that something extremely popular in one area could be unheard of in another. I guess it just hasn’t been one country for that long. It’s very big in Tuscany! I will have to make this–thank you for sharing the recipe! Thanks, and hope you enjoy it! Let me know. I’ve never had a grape focaccia though it seems like such a wonderfully natural pairing – can’t wait to try it! Saving the recipe for the holidays. I hope you enjoy it. 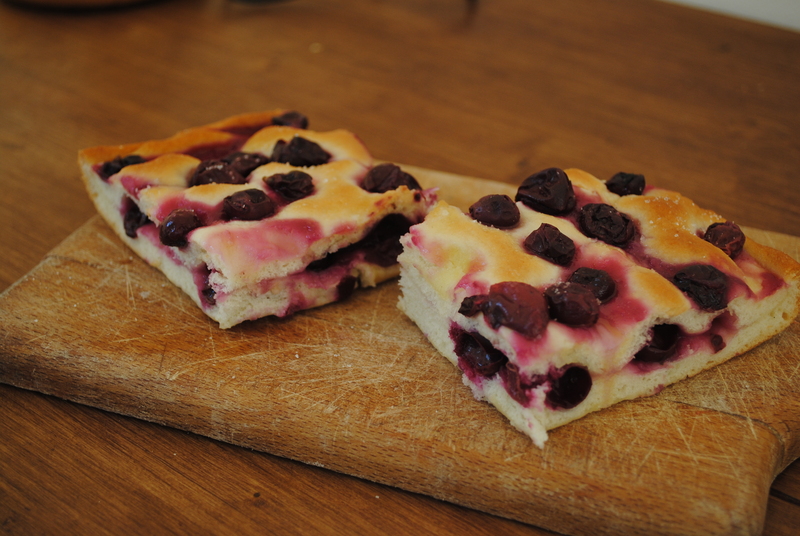 Blackberries, figs and blueberries are also recommended, but grape focaccia is the the classic. It’s very popular here. love the combination of olive oil focaccia and grapes. I have never had it, but really want to try it! It’s easy, you should give it a go! Thanks for the “like” so I could find your blog (just a few weeks ago I decided to make wordpress my main blog – I’m still finding my way around here:). Because I’ve been in Tuscany and in Greece, this is so interesting to me. Very practical idea to put nets on the ground, now I’m thinking about it – thanks for sharing! Now I’m wondering about the alternative to nets – individual baskets? Nets are very convenient. So glad you enjoyed reading. Beautiful bread! I just posted a recipe for focaccia with pomegranate seeds a few days ago (inspired by the idea of baking grapes into focaccia, even though I’ve never tried that before). I don’t think it would have occurred to me to split the dough into two layers and place some fruit in between, but the next time I make a fruit-adorned focaccia I will try that! Yours looks so delicious. Thank you! Two layers is good because it keeps the fruit inside soft and jammy, but if I’m lazy I use one layer. Have never thought of pomegranate but I think foccacia is good with almost all fruit – my favourites are grape and fig.